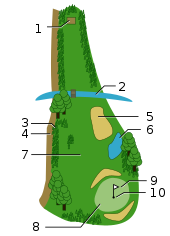 A golf course is divided into many sections with different difficulty levels. The basic structure of a golf course usually consists of the following sections: tee – box, fairway and green. Tee – box is where you make the first stroke. The purpose of players in this stroke is to hit the golf ball as close to the green as possible or at least lie on the fairway. Moreover, in order to understand clearly about the structure of a golf course, you may purchase a best golf watch 2017 for this purpose. The tee-box or tee is a flat and square surface. The first shot of the players is at this point. It is called the Tee Shot, Teeing or Driver. Teeing is done by placing the ball at key points called Tee and the players use driver club or any long wood club to hit the ball in the fairway and as close the green as possible. Fairway is the region stretching from the tee close to the green. Hitting the golf ball into the fairway is one of the main goals when playing golf. Because when the golf ball is in fairway area, the players will hit the ball from the fairway to the green easier than from the rough or the hazards. The golf clubs are called the fairway clubs are used for long shots to hit the ball out of the fairway. These clubs consist of club no.2 (now rarely use), no. 3, no.4 and no.5. This is the area surrounding the hole. In this area, grass should be very smooth because it is where the ball rolls into the hole. The types of grass in the green can be Bermuda grass or bentgrass (one kind of tube grass). Bentgrass is cut shorter than Bermuda grass, therefore, it helps the ball roll faster. The green areas are often designed with a slightly slope and very dry. The golf ball rolls faster on the dry green areas than on the wet green areas. Hole is an integral part of the sport of golf. A normal golf hole is 10.8 cm of diameter and the lowest depth is 10 cm. The hole is surrounded by the green. The position of the golf hole is marked by a small flag. The red flag means this hole is in front of the green. The white flag means this hole is in the middle of the green and the green flag means this hole is back of the green. According to the rules, if you forget to take the flag out of the hole before hitting the ball, you will not be allowed to touch the flag while the ball is moving. Rough is the boundaries around the fairway. The rough part is usually more crude because the grass is higher and not smooth compared to the grass in the fairway or the green. The players want to avoid this area in the golf course because it is an obstacle. I will be difficult for the players to hit the ball in the hole from the rough. While If the player hit the ball in the fairway is much easier.